WELCOME TO PARADISE!!! This beautiful, open concept Dartmouth model is perfect for you and your family. It boasts over 2, 500 sqft, high ceilings with crown molding, an upgraded kitchen with granite counter tops, beautiful dark wood 42" cabinets, stainless steel appliances and a 12 foot island. 3 large bedrooms, each with walk-in closets, 3 full bathrooms (2 en-suite), and a spacious den/office... which could easily be used as a 4th bedroom. This home sits on a quiet, side road with very little traffic, great for the kids! Large lot with plenty of room for your custom designed pool as you overlook the wooded preserve. This house is built to last! Endured Hurricane Irma without damage and NEVER LOST POWER! 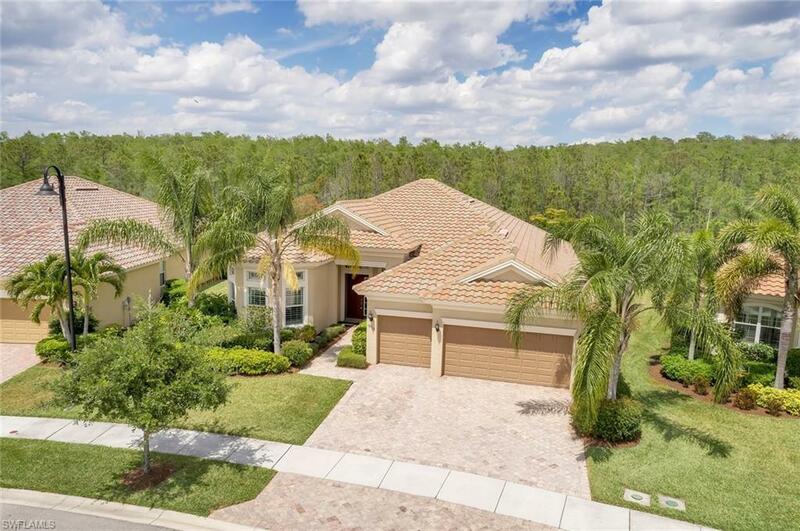 Community: A gated golf club community with two club houses, fitness center, resort style pool and spa, 6 tennis courts, billiard room, pickle ball and much more. Close to shopping, restaurants, beaches, SWFL airport and SPRING TRAINING! A perfect home to entertain or enjoy a quiet evening with family and friends.